Kyaw Thu is a FGA gemologist with a Ph.D. in Geology. Pala International knows him from trips in the mid-1990s as one of the most interesting young gem enthusiasts, among so many wonderful students and collectors we met. Both Will and Bill Larson consider him a special and close friend. He has helped answer many questions regarding locality information for Brendan Laurs of GIA as well as meeting in person Dr. George Harlow of the American Museum of Natural History and corresponding with him for almost a decade. He has opened a gem laboratory and has applied to GIA to further his education. I was given a copy of his PhD thesis last month and Dr. Harlow made it available by scan for interested parties. Pala International is honored to share this with our readers. The Mogok Stone Tract is very famous not only for the finest rubies and spinels but also for gem quality sapphire, peridot, etc. The study area lies in the northeastern part of Mogok Stone Tract covering the Mogok–Kyat-pyin, Bernard–Pyaung-gaung and On-dan areas. It is a mountainous region with two distinct valleys—Mogok Valley and Kyat-pyin Valley. Both valleys were formed by structural and lithologic controls; they are south-plunging synclinal valleys separated by an anticlinal ridge (Baw-padan Anticline). These two valleys contain a larger proportion of placer gemstones. The geology and the rock sequence of the area, modified from some previous works, and three new geological maps are presented. 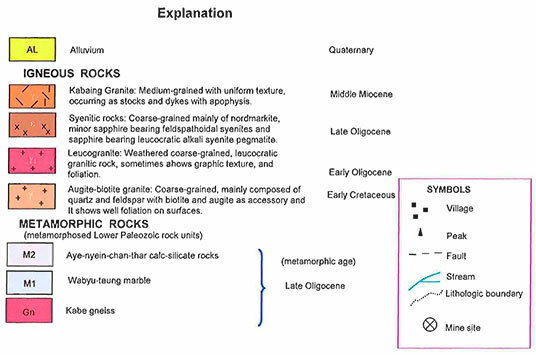 The rock sequence of the major rock units established is (from older to younger): Mogok metamorphics (metamorphosed Lower Paleozoic rock units—metamorphic age Late Oligocene), ultramafic and mafic rocks (Jurassic? ), leucogranite (Early Oligocene), syenitic rocks (Late Oligocene), Kabaing Granite (Middle Miocene), and pegmatites and aplites (Middle Miocene). 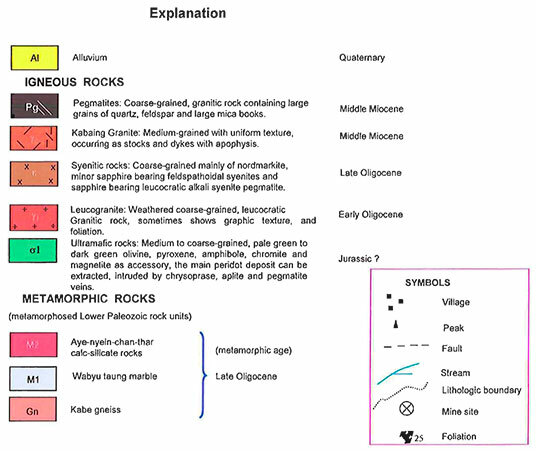 On the basis of detailed microscopic observations, modal analyses, and normative calculations, the various igneous rock types according to IUGS and Williams et al. classifications are dunite, harzburgite, pyroxene peridotite, and hornblende peridotite for ultramafic rocks; quartz syenite, alkali-felspar syenite, nepheline syenite, alkali-felspar syenite pegmatite, and quartz monzonite for syenitic rocks; urtite, ijolite, and jacupirangite for urtite series; augite-biotite granite, leucogranite and biotite microgranite (Kabaing Granite) for granitic rocks; pegmatites and aplites. 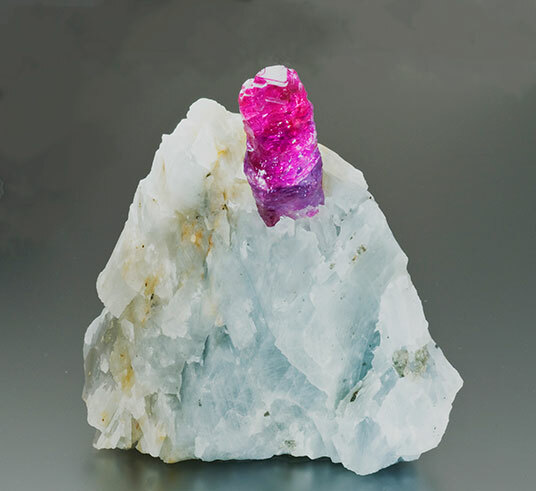 The pegmatites are complex, belonging to rare-element class, beryl type. On the basis of petrogenetic interpretations the igneous rocks of the area are mainly calc-alkaline and only partly alkaline. This is also evident from the bimodal distributions of the petrochemical data plots. The value of alkali-lime index (Peacock index) is 55 for the igneous rocks of the area, indicating the calcic to alkalic-calcic character in this area. ACF diagram and some distinctive chemical properties of the granitic rocks of the area indicate that these granitic rocks are mostly S-type granites. In K2O mol. vs Na2O mol. variation diagram, the plots of leucogranite, biotite microgranite and pegmatite fall in the field of late-kinematic granite. According to the petrochemical data, the granitic rocks of the area may be regarded as continental collision granites. In the alkaline rocks of the area, the (Na2O+K2O)/Al2O3 ratio is less than 1; thus according to Hyndman classification (1985), these alkaline rocks fall in the miaskitic type, i.e., not peralkaline. The origin of nepheline syenite as small irregular bodies in the marginal zones of Mogok marbles near the contact with leucogranite (as in the Thurein Taung area) or with syenite (as in the area northwest of On-dan) can be explained by the well-known limestone syntexis model. In a similar way the rocks of the urtite series may have been formed by the assimilation and desilication of the leucogranite or syenite in contact with mafic-rich marbles. The ultramafic rocks occur as layered intrusions in garnet-biotite gneiss in Bernard–Pyaung-gaung area. The ultramafic rocks of the area are considered to be not related to an ophiolite suite because of the absence of bedded chert, pillow lavas, basalt-diabase sheeted dyke swarms, and large-scale serpentinization. Field and petrochemical data suggest that the leucogranite and syenitic bodies intruded forcefully along a highly deformed zone roughly extending NE-SW. The depth of emplacement is estimated to range from katazone to mesozone. Kabaing Granite which is a large microgranite body intruded later at a shallower depth. Radiometric dates of zircon in four rock samples by U-Th-Pb method give 129± 8.2 Ma (Early Cretaceous) for augite-biotite granite, 32± 1 Ma (Early Oligocene) for leucogranite, 25 Ma (Late Oligocene) for foliated syenite, and 16± 0.5 Ma (Middle Miocene) for painite from the contact zone between leucogranite and marble. It has been observed that the syenitic rocks and pegmatites are especially important for the formation of precious gemstones of the area. The important gemstones with regard to the various igneous rock types are aquamarine, topaz, danburite, amethyst, moonstone, zircon in pegmatites, sapphire in syenite pegmatites, peridot in peridotite, and painite in leucogranite (contact zone). I acknowledge a special debt to Prof. Dr. U Thein (President, Myanmar Geoscience Society) for his guidance and suggestions for my research works. I owe a debt of thanks to Dr. Aye Ko Aung (Professor/Head, Geology Department, Dagon University) for reading the manuscript and suggestions rendered. Thanks are also extended to U Htay Win (Associate Professor/Head, Department of Geology, Yangon University) for his care and valuable advice. This dissertation came to fruition under the guidance of Professor Hla Kyi (Part-time Professor, Applied Geology Department) for reading the manuscript, his guidance, discussions and suggestions. My special thanks are due to Professor Thein Win (Pro Rector, West Yangon University), Professor Maung Ko (Part-time Professor, Geology Department, Yangon University), and Dr. Khin Maung Myint (Professor/Head, Geology Department, Mandalay University) for reading of the manuscript, discussions and suggestions, for the improvement of this manuscript. The author is grateful to Dr. Khin Zaw (Centre for Ore Deposit Research, University of Western Australia) for his generous help and suggestions for LA ICP-MS tests, X-RF and LRS tests during the research, and to Daw Ohh Mar Win (Lecturer, Universities’ Research Center) and to Dr. Moe Myintzu (X-RD section, D.A.E.) for the X-RF and X-RD results respectively. Individuals who helped are also numerous; my heartfelt thanks are due to U Zaw Nyunt and U Thant Zin and U Nay Myo for providing facilities and warm hospitality during the field trips. I wish to express my gratitude to Daw Thuzar Aung (Macle Gem Trade Lab.) for the help given throughout the study. Last, but not least I would like to express my sincere thanks to my parents and all my teachers who guided me to reach such a position. Any list of the classic, historically most important gem deposits of the world must include the Mogok Stone Tract. It is very famous not only for the world’s finest rubies and spinels but also for gem quality sapphire, peridot, etc. for many centuries. Sapphires are most abundant in Pan-sho, Kyat-pyin, Kyauk-pyat-that, Baw-mar, Lay-thar, and Ondan areas, peridot is limited to the area of Bernard–Pyaung-gaung, 10 km north-northwest of the Mogok Valley. Gem quality apatite, scapolite, moonstone, zircon, garnet, iolite, amethyst, danburite, etc. and some rare gemstones, painite, poudretteite, etc. are also found in this area. The Mogok Stone Tract lies in the northwest end of the Shan Plateau. The tract is sickle-shaped, with the vertical limb being formed by the Irrawaddy river. Its northern terminus is at the bend of the Shweli river, as it twists and bends, flowing at times from south to north into the Irrawaddy. The vertical limb of the tract extends south to north from Latitude 22° 54' 00" N up to 23° 01' 00" N, and the horizontal arm of the tract rubs along the Longitude 96° 12' 06" E as far as 96° 33' 30" E or approximately 380 km NNE of Naypyidaw, the capital of Myanmar, and also 200 km NE of Mandalay; refer to one-inch topographic maps no. 93 A/8, B/1, B/5, and B/9. The approximate length of the tract is about 37 km in E-W and width is about 13 km in N-S. Generally the study area can be divided into three different topographic units according to gemstone occurrences, viz: Mogok–Kyat-pyin area, Bernard–Pyaung-gaung area and On-dan area. The general area of the tract is very mountainous, forming a sort of amphitheater. The high mountains to the north run almost east-west. Most of the mining takes place in the alluvia of floors and flanks of the Mogok and Kyat-pyin valleys. Mogok Valley is the most important, consisting of a narrow alluvial plain, 5 km long running northeast-southwest, and about 1 km wide. Today a motor road leads from Mandalay north to Sagyin, past several villages and leads eastward, up a ridge about 1220 m, then descends to the beautiful green valley, namely Mogok Valley. Fig. 1.1. Three dimensional view of the geomorphology of the Mogok Stone Tract (TM image; 30 m resolution). Mogok–Kyat-pyin area is a mountainous region with two distinct valleys, Mogok Valley and Kyat-pyin Valley. The Mogok Valley is located at an elevation of 1158 m above sea level and the Kyat-pyin Valley is also located at 1350 m above sea level. East of the Kin chaung, the hills rise to massive ridges, which culminate in the Taungme Taung (2300 m), the highest point in the area; this peak dominates both the Bernard-myo (Ywa-thayar) and the Mogok Valley. It forms a pyramidal hill from which several ridges radiate in different directions. One of them, running east and south-east contains the Kyini Taung (2052 m) and Let-nyo Taung (1626 m), an arm of the above ridge, runs towards Mogok. Dattaw Taung (1555 m) in the east of Mogok, Shwe-daing, Lin-yaung-chi to Kadoke-tat, Baw-padan, Kyauk-poke, Kyauk-saung, Pingu Taung (1186 m), Kyauk-pyatthat (1700 m) in the west of Mogok show typical fold pattern (anticline-syncline nature) and famous for primary ruby deposits. The hills north of Kyat-pyin form picturesque ridges cut by deep valleys, the western most ridge being the Baw-lone, Kyauk-pyat-that, Myaing-gyi Taung, running west-south-west towards Kabaing. In this area, Kyauk-sin Taung forms the highest point. The typical feature is formed by the arc like or sinuous parallel ridges, which start from the east, run in an east-west direction, turn south in the centre and again run westwards. Bernard (Ywa-thaya)–Pyaung-gaung area forms the highest elevation of the Mogok Stone Tract, 1585 m above sea level. Most of the area is mountainous, rugged with steep slopes at the higher region, whereas moderate slopes to lowland with rounded hills at the lower part. The Injauk valley runs through this area, where diverging arms of the Taung-me Taung form high ridges and peaks at the Maw-giwa Taung (2043 m). However, some isolated hills and ranges, such as Mya-sein Taung, Zalat Taung, Htinshu Taung and Lay-thar Taung are also found as distinct landmark and famous gem deposits of this area. On-dan area occurs in the rugged and hard accessible territories of the hill regions, which are covered with dense forest. The most distinctive mountains are Shweu-daung Taung (1900 m), the highest peak in this area and Hnamataw-lay range. The Shwe-u-daung Taung takes a bend to the south, dividing Momeik from Mogok. Due north is Hnamataw-Lay range (approximately 1524 m high); to the south is a smaller hill, just 975 m high. Directly to the west are lower mountains that stretch to the Irrawaddy river, falling off as they approach the river. Fig. 1.2. Three dimensional view of the geomorphology of the Mogok Stone Tract (TM image; 30m resolution). In the study area drainage falls into two different systems. The first system starts from the northern watershed of the rugged, hilly and mountainous terrain and flowing from south to north, and then flowing into the Shweli river. Laung-zin chaung, On-dan chaung, Kin chaung, Nanpeit chaung and Nammeik chaung are typical for the drainage flowing from south to north, and also flowing into the Shweli river. Many streams criss-cross and help to drain the valley. The second drainage system start from the southern watershed of a rugged, hilly and mountainous region, flowing generally from northeast to southwest and from north to south, and then flowing into the Nampai chaung to Chaungmagyi river. Yini chaung, Nannga chaung, Nanat chaung, and Natpan chaung are good examples for the second system of drainage. Nampi chaung divides Mogok subdivision from the Mong-long. To study the distributions of the igneous rocks in the Mogok Stone Tract. To document the petrography, petrochemistry and petrogenesis (sequence and geochronology) of these igneous rocks. To investigate the gemstone deposits from these igneous rocks. Detailed geological mapping of the Mogok Stone Tract to investigate the structural and lithological features of igneous rocks. Systematic sampling of various igneous rock types. Gemstones sampling and to study the mode of occurrence of gemstones from igneous rocks of this research area. Detailed microscopic examination of various igneous rocks for better understanding of the petrography of the area. Quantitative and qualitative elements analysis of various igneous rocks and minerals samples using the EDX-RF in URC, Yangon University and WDX-RF, LA ICP-MS techniques in University of Tasmania, Australia to contribute the petrochemistry and mineral chemistry. X-ray diffraction analyses of unknown minerals from these igneous rocks in X-RD Laboratory, Department of Atomic Energy. The radiometric dating of four samples of the area was analysed by U-Th-Pb geochronology method using LA ICP-MS and SHRIMP techniques at University of Tasmania, Australia. Some selected gemstone samples were identified by LRS (Laser Raman Spectroscopy) at University of Tasmania, Australia to contribute the solid/fluid inclusions in the corundum. 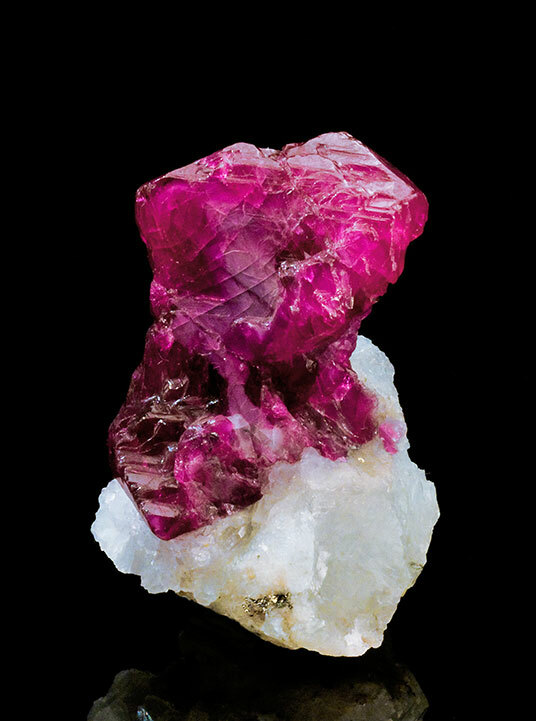 The Mogok Stone Tract has attracted many geologists, mineralogists and gemmologists from many parts of the world for producing the finest rubies on earth. Though rubies have been mined in Mogok for centuries, it remains unknown when these deposits were first discovered. The earliest historical record is a description of the ruby mines at Mogok by Father Giuseppe d’Amato as reprinted, unedited, [by] the Journal of The Asiatic Society of Bangal, in 1833 (v. 2, pp. 75–76). Brown and Judd (1896) reported mode of occurrence of the rocks and origin of gems, and firstly named the area as Mogok Stone Tract. Also they pointed out that the Mogok limestone, which [was] later named as marble, originated from the basic igneous rocks by means of complicated chemical reaction. They also considered the source of alumina in the corundum and spinel as the limestone itself. Kabaing Granite: Pegmatites, aplite, leptynite, minor intrusions, etc. ruby and sapphire regionally occurring in the Kyetsaung taung marble (a unit of Wabyudaung Marble) of this Mogok Belt is related to the fact that the Kyetsaung Taung marble is the host rock for the corundum mineral formation. This marble formation, like its unmetamorphic equivalent Wunbye Formation, with clayey or silty laminations, patches, or burrows was a carbonate unit rich in alumina. This rich alumina source, together with chromium content of the limestone after suffering from the high grade regional metamorphism caused by the granitic emplacement and several tectonism, was responsible for the formation of ruby. They further remarked that the occurrence of sapphire in syenite-alaskite might be accounted to the magma rich in alumina. Thet Tin Nyunt (2000) studied the mineralogy and petrology of Bernard–Pyaung gaung area. Thuzar Aung (2003) studied the petrology and gemstones of On-dan and its environs. In addition, the various workers from universities also carried out the geological investigation, on the basis of their purposes, mainly concentrated on the gemmology, mineralogy, petrology and structural geology for their M.Sc., M.Res. and Ph.D. research. Mogok Stone Tract is a segment of the Mogok Metamorphic Belt (MMB) of Searle and Ba Than Haq (1964), and is situated south of the eastern Himalayan syntaxis at the western margin of the Shan-Thai terrane. This originated in Gondwana (Ridd, 1971) and collided with Asia either in the latest Triassic (Mitchell, 1977; Metcalfe, 1988) or earliest Triassic (Metcalfe, 2000). The study area, situated in the northern part of MMB has long been of great interest because of the rubies, sapphires and other gemstones. The geology of the Mogok area is very complex, consisting mainly of high-grade metamorphic schists and gneisses, igneous intrusives, including gem bearing pegmatites, peridot bearing ultramafic rocks, and most importantly ruby and spinel bearing marble. Generally, metamorphism, migmatization and structural deformation have involved metasediments, which range in age from Precambrian or Cambrian to possibly Cretaceous. Acid, intermediate, mafic to ultramafic igneous rocks form an integral part of the Mesozoic to Tertiary igneous unit. The area is bounded in the north by east-west trending Momeik dextral fault (Sein Myint et al., 1979), Cretaceous Orbitolina bearing limestones which are intruded by gabbro and related rocks and older alluvial deposits are exposed. The boundary between the Tagaung-Myitkyina belt and the MMB is the high-angle Kyaukphyu fault, locally a southeast-dipping thrust (Mitchell et al., 2004). In the southern part of the area, Mong-long mica schist exposes a gneissic area intruded by tourmaline granite along the boundary. West of Mogok, Sagaing fault, major right-lateral strike-slip fault which is running north-south also dissecting Singu lava flow, and the western margin of the MMB is juxtaposed with late Tertiary sediments in the western portion. [In] the southern part of the Mogok, Mong-long mica schist striking nearly east occupies a broad belt of the gneissic area and is intruded by tourmaline granite along the boundary with gneiss. 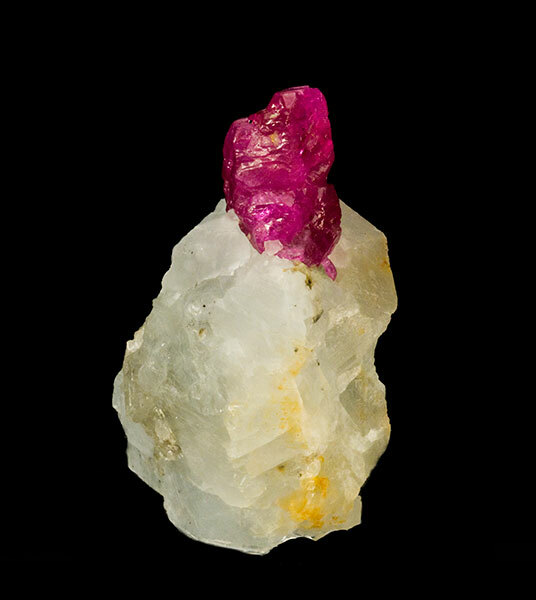 The Mogok Stone Tract is bounded, as well as overthrusted, by the Chaung-Magyi Group in the southeast along the Chaung-Magyi stream, and tourmaline granite is emplaced along the thrust plane (La Touche, 1913). Among the imbricated thrust sequence, Mogok Thrust (Searle and Ba Than Haq, 1964) is the most distinct principal thrust fault in this area. The Kabaing Granite intruded into the area forming large exposure at Kabaing village traceable west towards the Thabeikkyin area. Fig. 2.1. Regional geological map 0f the study area, modified after Bender (1983). Click to enlarge. Fig. 2.2. Regional geological map 0f the study area, modified after Bender (1983). On the basis of primarily field observations and petrographic data, and secondarily petrochemical and geochronological data, the geology and the rock sequence of the area are modified from some previous works (e.g. Iyer (1953), Myint Lwin Thein et al. (1990), Thet Tin Nyunt (2000), and Thuzar Aung (2003)). 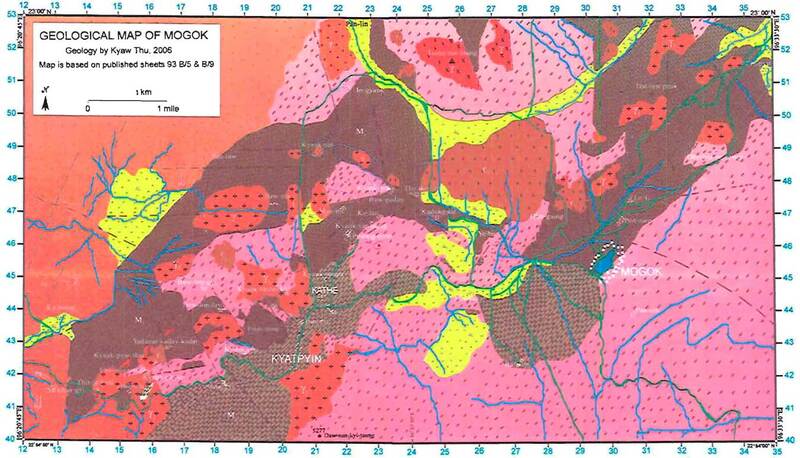 Three new geological maps were prepared for the Mogok–Kyat-pyin, Bernard–Pyaung-gaung and On-dan areas (Figs. 2.2, 2.3 and 2.4). According to radiometric dating suggested that the age of leucogranite, syenite, Kabaing Granite, and pegmatite of the area. [Wording appears to be omitted from previous sentence. 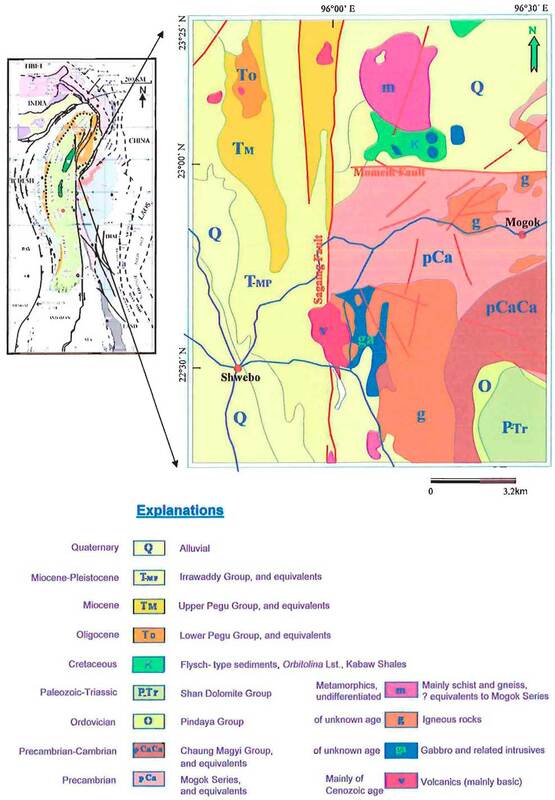 —Editor] However, the age of ultramafic rocks of the area are correlated with [the] eastern ophiolite belt of Myanmar (personal communication, Dr. Hla Htay, 2007). Field observations indicate that most of the igneous bodies in the area have intrusive contacts with the surrounding Mogok metamorphics or other igneous rocks. Regarding the age of the latest regional metamorphism of the Mogok metamorphics, Maung Thein (2000), using some GIAC data, mentioned that the age of regional metamorphism along the Mogok Metamorphic Belt occurred in Late Oligocene. On the basis of some radiometric dating Bertrand et al. (2001) suggested that the age of metamorphism along the Mogok Metamorphic Belt ranged from Oligocene to Middle Miocene. 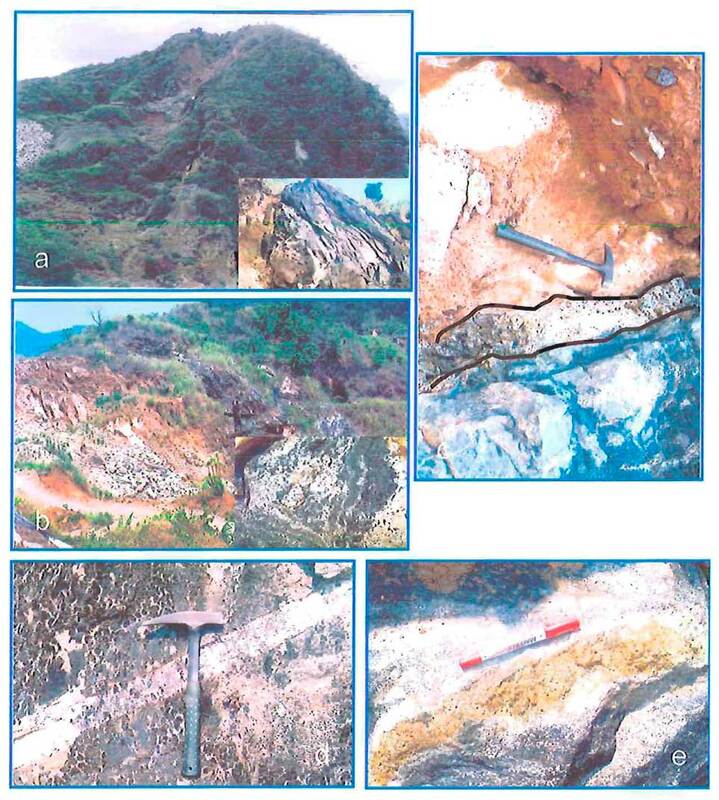 However, it should be pointed out that Kabaing Granite (15–16 Ma) intruded into the Mogok metamorphics. Thus, the metamorphic age of the Mogok metamorphics would not range up to Middle Miocene. Table 2.1. Major geological succession of the study area. Ultramafic rocks are relatively subordinate in the Bernard–Pyaung-gaung area, which are mostly intruded into the garnet-biotite gneiss (probably older than Mogok metamorphics). However, the biotite microgranite and the late stage of pegmatite are intruded into the peridotite at Pyaung-gaung, so these ultramafic rocks are generally older than biotite microgranite and pegmatite. It may be assumed that they have been emplaced to the garnet-biotite gneiss as early Jurassic?. Recent field evidences indicate foliated and highly jointed augite-biotite granite (129.8±8.2 Ma). Early Cretaceous is intruded by leucogranite, which are foliated at the margin of the intrusion and trending nearly NE-SW at Taung-me Taung and Shwe-udaung Taung, the highest peak of Mogok area, showing that the foliated augite-biotite granite is older than the leucogranite (32±1 Ma) Early Oligocene in age. Leucogranite occurs widespread as small stocks and dykes, which are intruded into regionally metamorphic rocks as well as syenite intruded into these rocks at Thurein taung. The contact relationship between leucogranite and biotite microgranite is absent in the study area. However, U/Pb zircon age of syenite is 25 Ma (Late Oligocene); it is younger than leucogranite. Also, some pegmatite dykes are intruded into the leucogranite at Dattaw and Pein-pyit area, indicating that the leucogranite is older than the pegmatite. Fig. 2.3. 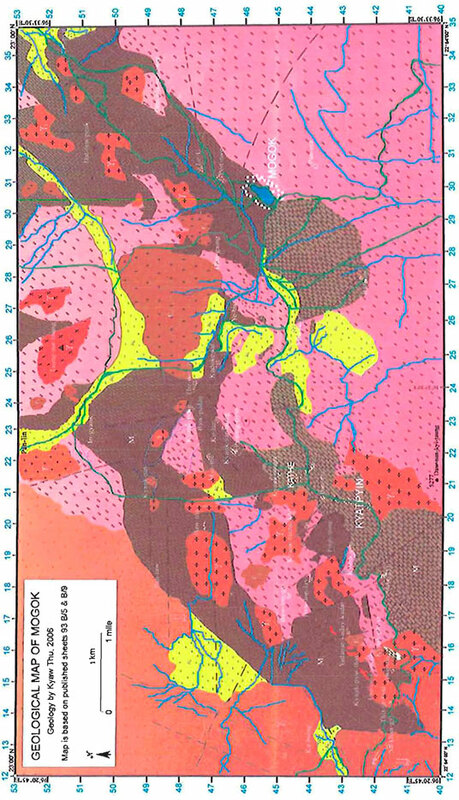 Geological map of Mogok–Kyat-pyin area, geology by Kyaw Thu, 2006. Click to enlarge map. Fig. 2.4. 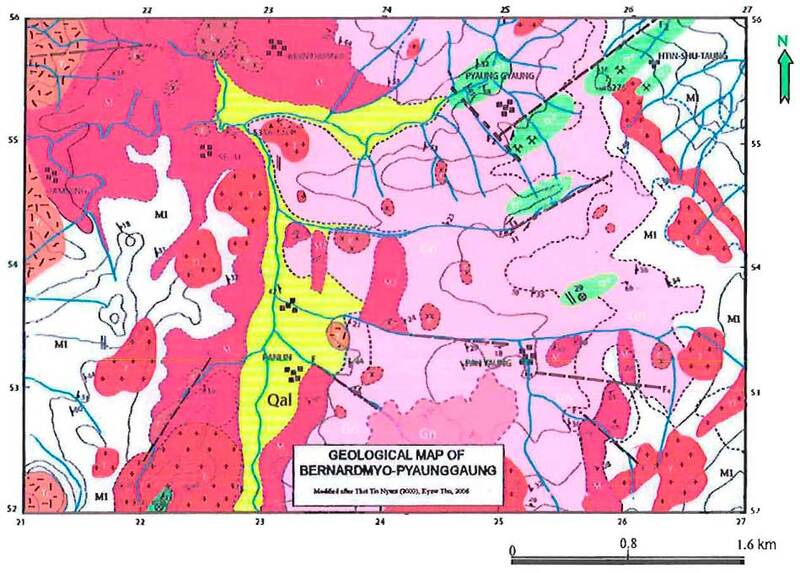 Geological map of Bernard–Pyaung-gaung area, modified after Thet Tin Nyunt (2000), Kyaw Thu (2006). Click to enlarge map. Fig. 2.5. Geological map of On-dan area, modified after Thuzar Aung (2003), Kyaw Thu (2006). Click to enlarge map. Syenitic rocks and urtite series have intruded into the Mogok metamorphics in this area, as well as intruded into the leucogranite, i.e., syenite is younger than the leucogranite. But, biotite microgranite has intruded into the syenite in On-dan area, indicating that syenite is older than biotite microgranite (15.8±1.1 Ma) Middle Miocene. The Kabaing Granite occupies a large tract of country to the NW of Mogok–Kyat-pyin area. It is intruded into the all Mogok metamorphic rock units and parts of the syenite, ultramafic and leucogranite. Unlike the augite-biotite granite, leucogranite, and syenite, the Kabaing Granite shows no signs of diastrophism and its emplacement post-dates that of the syenitic rocks. In Sakhan-gyi and Pan-taw, the Kabaing Granite is intruded by pegmatite dykes (15 Ma) Middle Miocene (Searle and Ba Than Haq, 1964) with trend of NNE-SSW in direction indicat[ing] that these pegmatites are younger than other igneous rocks. The term pegmatite is a textural definition. 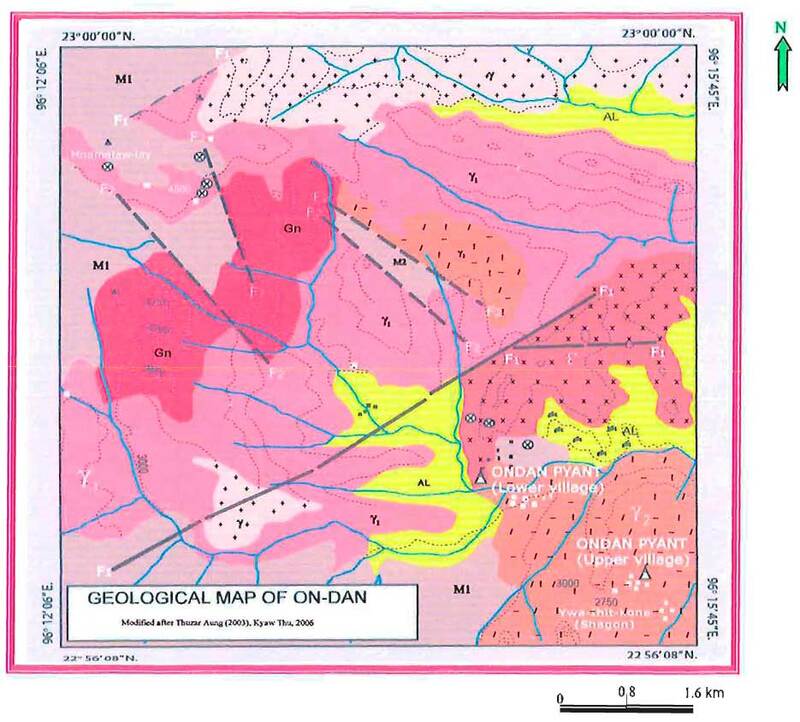 The important pegmatite exposures [are] situated at Sakhan-gyi and Pan-taw, which are intruded into the Kabaing Granite. They usually occur as medium to very coarse-grained dykes, highly weathered and mostly kaolinized, whitish on fresh surfaces and brownish on weathered surfaces. The important gemstones and some rare gemstones are found in these pegmatites. Other pegmatites are also exposed at west of Pan-lin, Dattaw, Le-u and Pein-pyit area intruding the leucogranite and metamorphic rocks. Southeast of Pyaung-gaung area, the pegmatites are intruded into the peridotite and dunite. Minor aplite dykes and veins are also present in this area. Kabaing Granite is one of the major intrusive igneous rocks in Mogok, and was first noticed by Brown and Judd (1896) near Kabaing on the motor road. This granite is a biotite granite, greyish, hard, compact and massive, medium-grained, homogeneous in texture, and regionally discordant to Mogok metamorphics. It occupies a vast area centered at Kabaing village, extending to Kyauk-pyat-that, turns northeast [to]wards Sawlone-gyi, and also extending to Kyauk-sin, Pan-taw and Injauk to Tam-saing and Laythar near Momeik boundary, where it is intruded into the Mogok metamorphic rock units. This microgranite is found at the southern and western part of On-dan village, which are intruded into the marble and leucogranite. Its southern boundary starts from Nam-sita chaung and passes under the quartzite south of Gwe-bin. 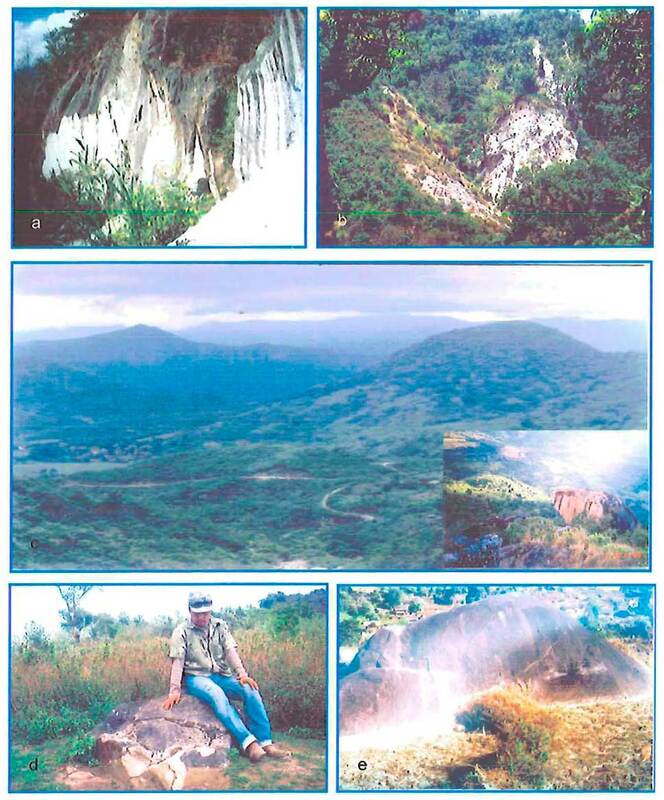 This granite is also found north of Kathe, Kyauk-sin–Kyat-pyin road, north of Kyat-pyin view point and intruded into the marble north of Luda on the Mogok–Kyat-pyin road. It is also intruded into the garnet-biotite gneiss in Chin-the Taung and Hin-tha Taung slopes. The boundary of the Kabaing Granite and the country rocks [is] not very definite, as there is a thick cover of soil and [it is] heavily forested. Exfoliated or spheroidal weathered exposures are common in this area. Fig. 2.6. (a) Highly weathered pegmatite exposure, Sakhan-gyi, 22° 54' 1.2" N, 96° 20' 56.1" E; (b) dyke of pegmatite at Pan-taw, 22° 57' 47.3" N, 96° 24' 15.6" E; (c) panoramic view of Kabaing Taung; inset: large block of biotite microgranite showing exfoliated nature at the peak, near Kabaing village; (d) small outcrop of Kabaing Granite showing onion skin weathering, 22° 57' 14.9" N, 96° 24' 54.6" E, Kyauk-sin–Pan-taw area; (e) an outcrop showing exfoliation nature in biotite microgranite, near On-dan village, 22° 57' 12.2" N, 96° 14' 38.05" E. Click to enlarge. Prof. Adams (1926) was the first to discover this suite of rocks on the Mogok motor road near view point to Sin-khwa. These rocks are mainly found in Kyauk-pyat-that, Myaing-gyi Taung, Thurein Taung, Sin-khwa and Ye-aye environ area, which are intruded into the marble and leucogranite, forming lenticular bodies, 10 cm to 20 cm in exposed width and at least 100 m in exposed length. These rocks show a gneissic banding nature, or are granulitic and vary in the amount of their salic and femic constituents. Other minor exposures of these rocks occur near Chaung-gyi, Injauk, south-east of Taung-me Taung and north-west of Bernard-myo (Ywa-thayar). The syenitic rocks were first discovered in this area by Fermor (1932). These rocks are formed as sills or sheets, dykes and small stocks around the Mogok area. Syenite exposures are scattered or may cover vast areas and they may show foliation. This unit is found well developed in the area between Mogok and Taung-me Taung and around Let-nyo and Lay-thar Taungs. It is well seen as small stock between Taung-me–Mogok area, which is in contact with the marble. The rock occurs as dykes north of Ohn-gaing, Ye-bu, Dattaw chaung, Pein-pyit, Kyauk-wa, Achauk-taw, and Chaung-gyi chaung. Exfoliated syenite boulders are found near the village of Ma-nar and are locally called “ge-sein” (in Myanmar, green rock). Fig. 2.7. (a) Phlogopite-diopside marble and urtite rocks contact in Thurein Taung, 22° 54' 12.2" N, 96° 22' 18.8" E; urtite exposure showing highly brecciated nature due to fault contact nature (inset); (b) urtite and white marble contact in Yadana-kadae-kadar mine, 22° 54' 34" N, 96° 22' 31" E; mafic minerals mainly hornblende and nepheline in surface of urtite exposure (inset); (c) urtite intruded into the marble showing scapolite-diopside-graphite contact zone, 22° 54' 11.3" N, 96° 22' 17.3" E; (d) pegmatite vein intruded into the urtite body, Thurein Taung, 22° 54' 12.4" N, 96° 22' 20.6" E; (e) xenolith of nepheline syenite in urtite, Thurein Taung, 22° 54' 12.7" N, 96° 22' 20.7" E. Click to enlarge. Fig. 2.8. (a) A distinct syenitic rocks exposure showing exfoliated nature in syenite exposure, north of Ohn-gaing village, 22° 56' 27.2" N, 96° 29' 36.8" E; (b) syenite exposure at Kyauk-wa, north of Mogok; (c) dyke of urtite in syenite exposure, north of On-dan, 22° 57' 16.4" N, 96° 14' 39" E. Click to enlarge. Bernard-myo exposure is the next largest one, which is well exposed at the southwest and northern part of Bernard-myo. Small exposures are found at the southern part of Pyaung-gaung village and east of Pan-lin village. It extends as the minor bands on to the Kyauk-thita Taung and north-east of Injauk. Other smaller exposures are also present. Other exposures are found at the Kyat-pyin environs, such as east of Kyauknaga, north-east and west of Tha-dut-sho and north of Pyaung-pyin, and north-east of Baw-Ion-gyi, Kyauk-sin, and Baw-ma. 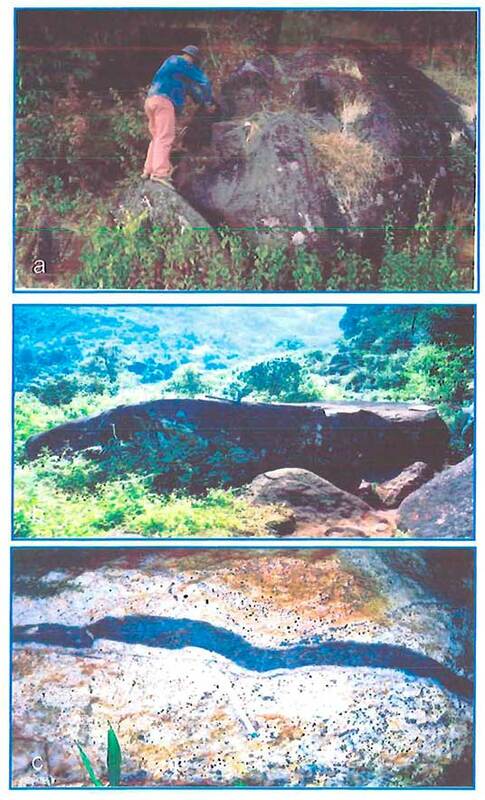 Exposures of syenitic rocks are also found as small stock and dykes around Pin-gu Taung, Kyauk-pyat-that, and Thurein Taung, Gegyi Taung, and northwest of On-dan village associated with leucogranite. A few small exposures of the syenitic rocks are also observed in this study area closely associated with the Mogok marble as a result of ruby formation by contact metamorphism. These rocks were previously described as “Alaskite Suite” by Searle and Haq (1964), later renamed by Myint Lwin Thein et al. (1990) as “Pingu Taung Leucogranite.” Leucogranite constitutes the major part of the igneous rocks found in the Mogok Stone Tract, which intruded into Mogok metamorphic rocks and it appears highly weathered, showing pronounced exfoliation with graphic texture and foliation. 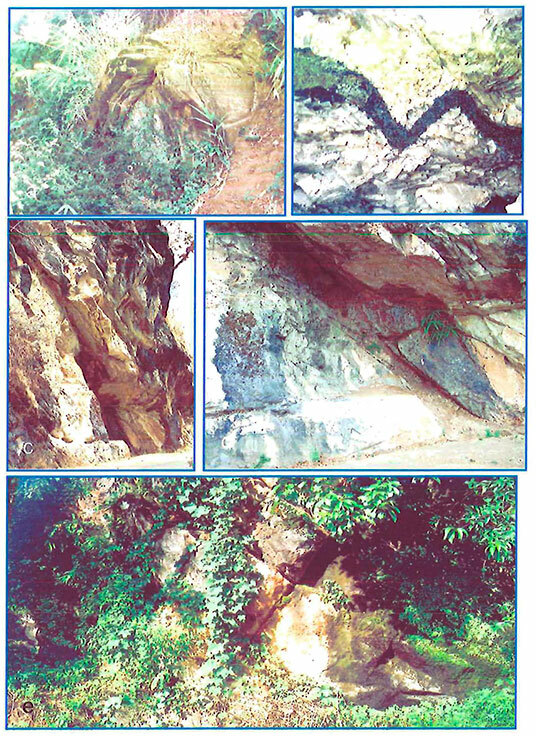 Between Mogok and Kyat-pyin, these rocks are found in the west of Pein-pyit, south, south-west and north-east of Dattaw Taung, east and north-east of Le-u. This unit crops out as an intrusive mass around the peak of Kyauk-taung-kon, Myo Taung, Chin-the Taung, and as small bodies in Ye-aye valley, and also at the base of western and northern spur of Pingu Taung, extended along the foot path between Baw-Ion-gyi and Baw-mar, and at the Gwe-bin chaung near the Kyauk-pya village. These leucogranites are closely related to the syenitic rocks, and probably important source rocks for radioactive minerals in Mogok. In the Bernard-myo area, it is the most abundant igneous rock and mainly found in the western part of Pan-lin and Ye-ne-inn villages, which are intruded into the garnet-biotite gneiss and calc-silicate rocks. In the southern part of Htin-shu Taung, leucogranite intruded into the marble and shows foliated nature. Leucogranite occurs as the largest intrusive mass in the On-dan area, typically found in Pa-Iaung Tung, Hnama-taw-Iay range, at the base of Tant-khan Taung to [the] western part of On-dan village. These rocks are closely associated with Mogok metamorphic rocks as well as syenite and augite-biotite granite in this area. Fig. 2.9. 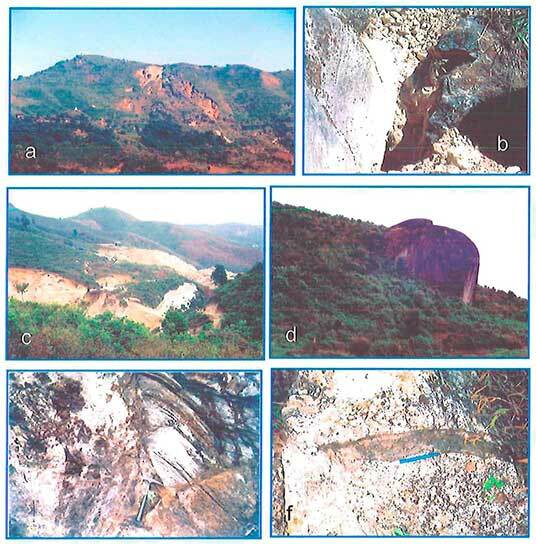 (a) A distinct exposure of leucogranite in Hin-thar Taung; (b) photograph showing leucogranite and diopside-phlogopite marble contact to form the painite deposit in Wet-loo mine, 22° 54' 28.5" N, 96° 23' 34.9" E; (c) highly weathered leucogranite exposed in Saw-mar mine; (d) an outcrop showing exfoliated nature in leucogranite, north of Saw-mar; (e) photograph showing leucogranite intruded into the garnet-biotite gneiss in Pan-taw, 22° 57' 44.6" N, 96° 24' 41.7" E; (f) syenite vein in leucogranite about three feet in thickness, Wet-loo mine, 22° 54' 28" N, 96° 23' 35" E. Click to enlarge. The main intrusions are along the Shwe-u-daung Taung range, north of On-dan village and Taung-me Taung peak, north of Mogok respectively. In On-dan, augite-biotite granite is found intruded by leucogranite in some outcrops. It shows strong foliation on weathered surfaces, similar to ridge and furrow structure. Other small exposures occur in the area such as Kyauk-sin and Saw-mar, which are very similar in weathering effect to the syenitic rocks, [and] represent their more acid phase. Ultramafic rocks of the Mogok Stone Tract occur as layered intrusions in garnet-biotite gneiss (probably older than Mogok metamorphics) in Bernard–Pyaung-gaung area, north-eastern part of the Mogok. These rocks are distinctly cropped out at the Pyaung-gaung, Zalat Taung, Mya-sein Taung, Thit-ta-pin Taung, and Htin-shu Taung environs. Rarely, amphibolite and micaite rocks are also encountered in this area. Smaller bodies of biotite microgranite, feldspathic veins and veinlets of chrysoprase are also found intruded in these peridotite-dunite. The mafic rocks, mainly gabbro, occur as small bodies in the surrounding area of Kyauk-pyat-that, environs of Ye-aye, Injauk and north-west of Tam-saing, which are not always large enough to be mapped. According to the TM image and photogeological interpretation, the study area is very complex in geological structure. [The] general trend of the rocks of Mogok area is distinctly in ENE-WSW direction and generally steeply inclined towards southeast direction. Numerous folds, faults and joints are involved. This area lies in a series of continuous and discontinuous anticlinal ridges and south-plunging synclinal valleys extending laterally from Kyini Taung to Kabaing, [and] marble and calc-silicate rocks are widespread throughout in this regional fold pattern. Fig. 2.10. 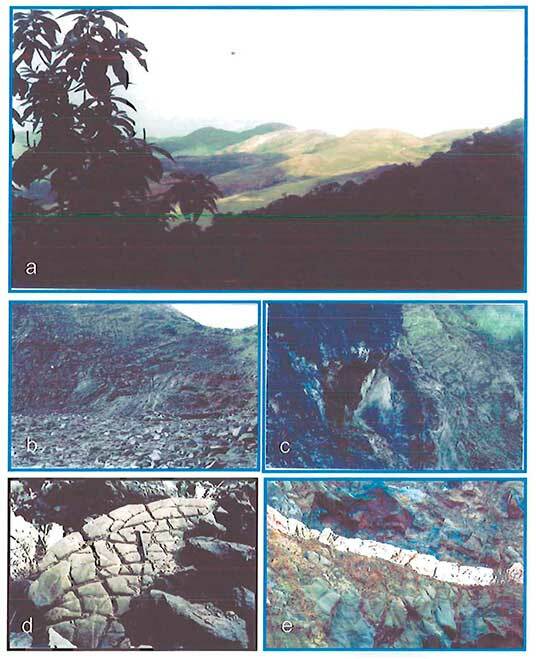 (a) Panoramic view of the peridolite-dunite bodies, north-east of Bernard-myo; (b) peridotite exposure showing false bedded nature, Mya-sein Taung, 23° 00' 03.4" N, 96° 27' 54.4" E; (c) photograph showing peridotite partly altered to serpentinite due to the auto metamorphism, 22° 59' 55" N, 96° 27' 46.6" E; (d) an outcrop showing jointed nature in dunite, Pyaung-gaung, 23° 00' 40.5" N, 96° 26' 40.0" E; (e) pegmatite dyke in peridotite and chrysoprase veins in upper part of photo, Mya-sein Taung, 23° 00' 10.5" N, 96° 27' 44.9" E. Click to enlarge. Fig. 2.11. 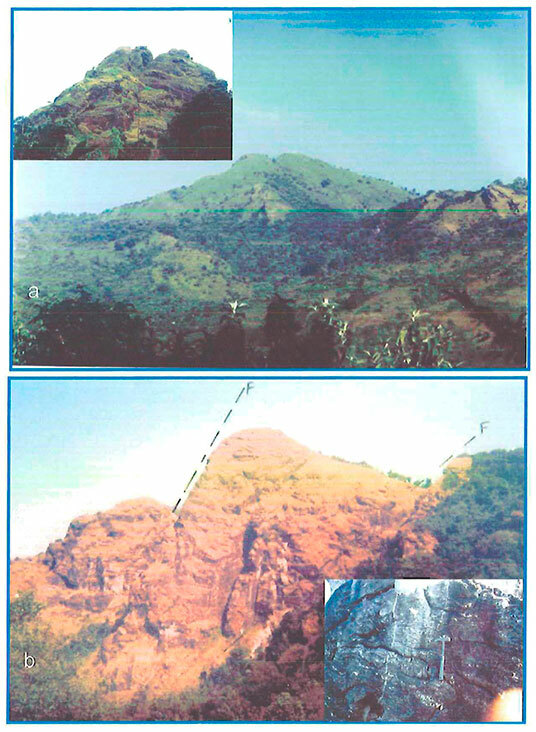 (a) Panoramic scenery of Taung-me Taung; augite-biotite granite exposure at the peak of Taung-me Taung (inset), 22° 58' 18.4" N, 96° 28' 8.5" E; (b) augite-biotite granite exposure showing the distinct faulted nature in Shwe-u-daung Taung; inset; small quartzo feldspathic vein cross cut in foliated augite-biotite granite, north of On-dan village, 23° 01' 12.1" N, 96° 13' 19.07" E. Click to enlarge. [An]other distinct feature is the Mogok thrust, generally NE-SW trending and which follows a sinuous outcrop from the head of Mogok valley to southwest of Gwebin village; however, the appearance of the thrust between Mogok and Kyat-pyin is vague by the high accumulation of faulting, and some forceful emplacement of leucogranite. Deformation, as being the equivalent of local stretching of crustal material around the eastern Indian syntaxis, [was] active between Oligocene and Middle Miocene (Bertrand et aI., 2001). At the Latitude of [the] Mogok area, the deformation was sealed at about 16 Ma (Middle Miocene) by intrusion of the Kabaing Granite. Fig. 2.12. (a) Photograph showing mullion structure in calc-silicate rock due to the thrusting, east of Gwe-bin, 22° 53' 44" N, 96° 22' 24" E; (b) dyke of urtite showing folded nature in marble indicating tectonism effect, Kyauk-saung, 22° 55' 21" N, 96° 25' 53" E; (c) the exposure showing Mogok thrust, north-west directed thrust plane at north of Mogok, 22° 56' 37.5" N, 96° 31' 22" E; (d) close-up view of photo (c) showing footwall carbonate mylonite along the thrust zone; (e) well jointed nature in phlogopite marble at Gwe-bin. Click to enlarge. Thus conclude Chapters I and II. Access Chapter III here. Adams, E.D., 1926. A visit to the gem districts of Ceylon and Burma. Bull. Can. Inst. Min. Met. v. 166, pp. 213–246. Barley, M.E, A.L. Pickard, Khin Zaw, P. Rak and M.G. Doyle, 2003. Jurassic to Miocene magmatism and metamorphism in the Mogok metamorphic belt and the Indian-Eurasia collision in Myanmar. Tectonics, v.22, no.3, pp. 1–11. Bender, F. 1983. Geology of Burma. Gebruder Borntraeger, Berlin, 293 pp. Bertrand, G, C. Rangin, H. Maluski, Tin Aung Han, Myint Thein, Ohn Myint, Win Maw and San Lwin, 1999. Cenozoic metamorphism along the Shan scarp (Myanmar): evidences for ductile shear along the Sagaing fault or the northward migration of the eastern Himalayan syntaxis. Geophysical Research Letters, v. 26, pp. 915–918. Bertrand, G., C. Rangin, H. Mluski, H. Bellon and GIAC Scientific Party, 2001. Diachronous cooling along the Mogok Metamorphic Belt (Shan scarp, Myanmar): the trace of the northward migration of the Indian syntaxis. Journal of Asian Earth Sciences, v.19, pp. 649–659. Brown, C.B. and J.W. Judd, 1896. 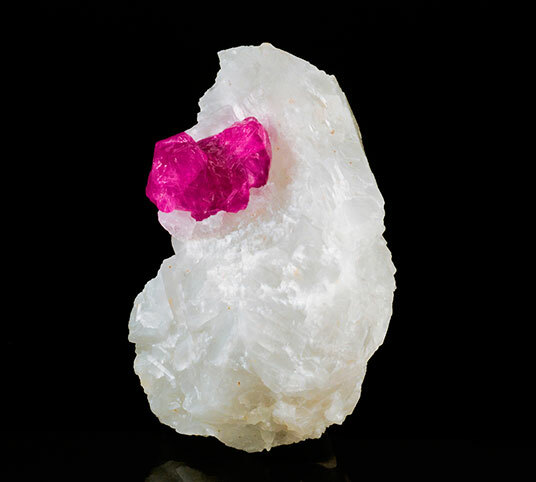 The rubies of Burma and associated minerals; their mode of occurrence, origin and metamorphoses: a contribution to the history of corundum. Philosophical Transaction of the Royal Society of London. Series A, v. 187, pp. 151–228. Brook, M., and N.J. Snelling, 1976. K/Ar and Rb/Sr age determinations on rocks and minerals from Burma. Inst. Geol. Sci., London, Isotope Geol. Unit Report 76/12, p.20. Buddington, A.F., 1959. Granite emplacement with special reference to North America, Geol. Soc. Am. Bull., v. 70. pp. 671–747. Cerny, P., 1991. Rare-element granitic pegmatite: regional to global environments and petrogenesis. Geosci. Can., v. 18, pt. 2, pp. 68–81. Chappell, B.W. and A.J.R. White, 1974. Two contrasting granite types. Pacific Geol., v. 8, pp. 173–174. Clegg, E.L.G. 1941. The Cretaceous and associated rocks of Burma. Mem. Geol. Surv. India, v. 74, pt.1, 101 pp. Cobbing, E.J., P.E.J. Pitfield, O.P.E. Darbyshire and D.J.J. Mallick, 1992. The granites of the South-East Asian tin belt. Overseas Memoir, British Geological Survey, London, no. 10, 369 pp. Fermor. L.L., 1932. The Mogok Stone Tract, Katha District. Rec. Geol. Surv. India, v. 65, pt. 1, pp. 80–86. Hatch, F.H, A.K. Wells and M.K. Wells, 1961. Petrology of the igneous rocks, Thomas Murby, London, 514 pp. Heron. A. M., 1937, Age of Mogok series, Rec. Geol. Surv. India, v. 72, pt. 1, pp. 62–64. Hla Kyi, T. Themelis and Kyaw Thu, 2005. The pegmatitic gem deposits of Molo (Momeik) and Sakhan-gyi (Mogok). The Australian Gemmologist, v. 22, no. 7, pp. 303–309. Hutchison, C.S., 1975. The norm, its variations, their calculation and relationships. Sch. Min. Pet., Mitt., v. 55, pp. 243–256. Hyndman, D.W, 1985. 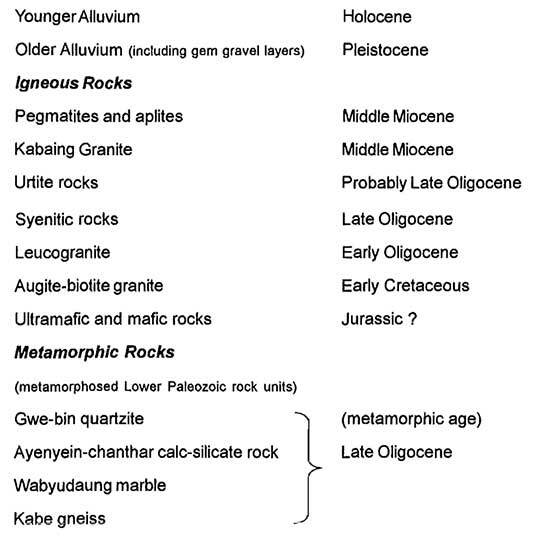 Petrology of igneous and metamorphic rocks. New York, McGraw-Hill. 2nd edt., 786 pp. Irvine, T.N. and W.R.A. Barager, 1971. A guide to the chemical classification of the common volcanic rocks. Can. Jour. Earth Sci., v. 8, pp. 523–548. Iyer, L.A.N., 1953. The geology and gemstones of the Mogok Stone Tract, Burma. Mem. Geol. Surv. India, v. 82, pp. 100. Kerkvoort, G.V., 1995. Rare metal granitic pegmatites. Unpublished B.Sc. Hons. Thesis, University of Tasmania, Australia, 70 pp. Khin Zaw, 1986. Geological, petrological, and geochemical characteristics of granitoid rocks in Burma: with special reference to the emplacement of W-Sn mineralisation and their global tectonic implications. Unpublished research paper. Khin Zaw, 1998. Geological evolution of selected granitic pegmatites in Myanmar (Burma): constraints from regional setting, lithology, and fluid-inclusion studies. International Geology Review, v. 40, pp. 647–662. La Touche, T.H.D., 1913. Geology of the northern Shan States. Mem. Geol. Surv. India, v. 39, pt. 2, 379 pp. Maniar, P.D., and P.M. Piccoli, 1989. Tectonic discrimination of granitoids. Geol. Soc. Am. Bull., v. 101, pp. 635–643. Marmo, A., 1956. On the emplacement of granites. Amer. Jour. of Sci., v. 254, pp. 479–492. Maung Thein, 2000. 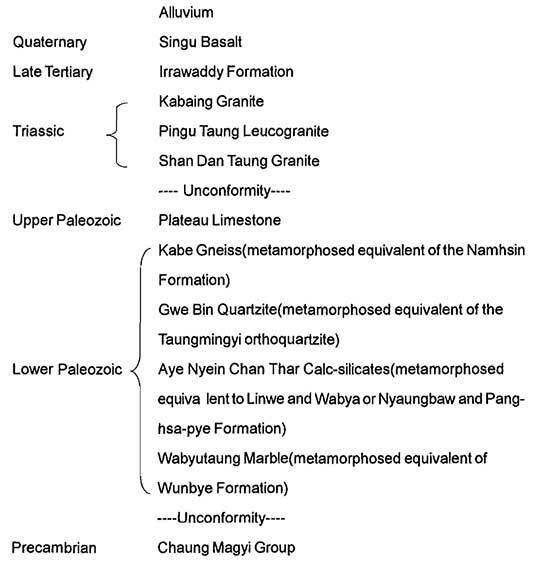 Summary of the geological history of Myanmar. Unpublished paper, p.8. Metcalfe, I., 1998. Origin and assembly of South-East Asia continental terranes. In: Audley Charles, M.G., Hallam, A. (Eds. ), Gondwana and Tethys, Special publication Geological Society of London, v. 37, pp. 101–118. Metcalfe, I., 2000. The Bentong-Raub suture zone. Journal of Southeast Asian Earth Sciences, v. 18, pp. 691–721. Mitchell, A.H.G., 1977. Tectonic setting for emplacement of Southeast Asia Tin granites. Geological Society of London, v. 141, pp. 123–140. Mitchell, A.H.G., 1992. Late Permian-Mesozoic events and the Mergui Group nappe in Myanmar and Thailand. Jour. of SE Asia Earth Sciences, v. 7, pp. 165–178. Mitchell, A.H.G., 1993. Cretaceous-Cenzoic tectonic event in western Myanmar (Burma)—Assam region: Jour. of the Geol. Soc. London, v. 150, pp. 1089–1102. Mitchell, A.H.G., C.A. Ausa, L. Deiparine, Tin Hlaing, Nyunt Htay and Aung Khine, 2004. The Modi Taung-Nankwe gold district, Slate Belt, central Myanmar: mesothermal veins in a Mesozoic orogen. Journal of Asian Earth Sciences, v. 23, pp. 231–341. Mitchell, A.H.G., Myint Thein Htay, Kyaw Min Htun, Myint Naing Win, Thura Oo and Tin Hlaing, 2006. Rock relationships in the Mogok metamorphic belt, Tatkon to Mandalay, central Myanmar. Jour. of Asian Earth Sciences. doi:10.1016/j.jseaes.2006.05.009, pp.1–20. Myint Lwin Thein, Ohn Myint, Sun Kyi and Phone Nyunt Win, 1990. Geology and stratigraphy of the metamorphosed Early Paleozoic rocks of the Mogok-Thabeikkyin-Singu-Madaya areas. Unpublished staff report, no. 98, A.G.D., Y.U., p.24. O’Connor, J.T., 1965. Classification of quartz-rich igneous rocks based on feldspar ratios. U.S.G.S. Prof. Paper. 525B, pp. 79–84. Piwinskii, and P.J. Wyllie, 1970. Experimental studies of igneous rock series: felsic body suite from the Neddle point pluton, Wallowa Batholith, Oregon. Jour. Geol. v. 78, pp. 52–76. Ridd, M.F., 1971. South-East Asia as a part of Gondwana land. Nature, v. 234, pp. 531–533. Rossman, G.R., Saw Naung Oo, G.E. Harlow and J. Hunt, 2005. A second source in Myanmar and metasomatic origins. Goldschmidt Conference Abstract, Geochemistry of Gem Deposits Sec., pp. 278–279. Searle, D.L. and Ba Than Haq, 1964. 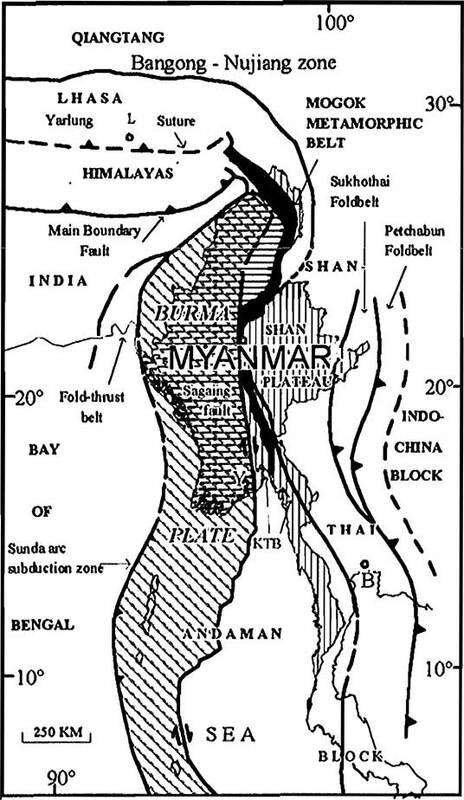 The Mogok belt of Burma and its relationship to the Himalayan orogeny. in Int. Geol. Cong., Twenty-Second Sec., India, Himalayan and Alpine orogeny, Sec. 11, pp. 132–161. Sein Myint, Than Naing and Soe Nyunt Swe, 1979. 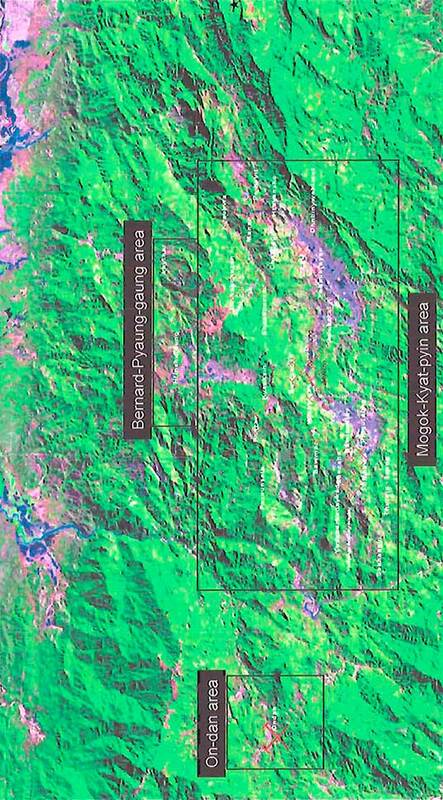 Satellite imagery interpretation of major lineaments in part of northeastern Burma. Contribution to Burmese Geology, v. 1, no. 1. pp. 20–25. Smirnov, V.I., 1976. Geology of mineral deposits. MIR Publishers, Moscow, 520 pp. Sutherland, F.L., D. Schwarrz, E.A. Jobbins, R.R. Coenraads and G. Webb, 1998. Distinctive gem corundum suites from discrete basalt fields: a comparative study of Barrington, Australia, and West Pailin, Cambodia gem fields. Journal of Gemmology, v. 26, pp. 65–85. Sylvester, P. J., 1989. Post-collision alkaline granites. Jour. of Geol., v. 97, pp. 261–280. Thet Tin Nyunt, 2000. Mineralogical and petrological studies of Bemard-Pyaunggaung area, Mogok Township, Mandalay Division. Unpublished M.Sc. Thesis, University of Yangon, 184 pp. Thuzar Aung, 2003. 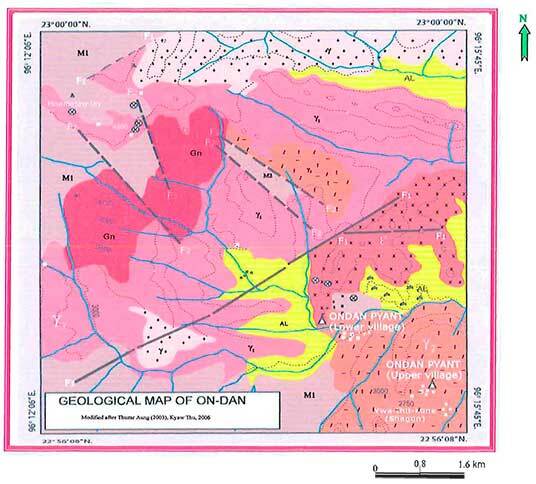 Petrology and Gemstones of Ondan and its Environs, Mogok Township, Mandalay Division. Unpublished M.Res. Thesis, University of Yangon, 90 pp. Tuttle, O. F., and N.L. Bowen, 1958. Origin of granite in the light of experimental studies in the system NaAISip8-KAISiP8-Si02-H20. In: Hyundman, D.W., 1985. 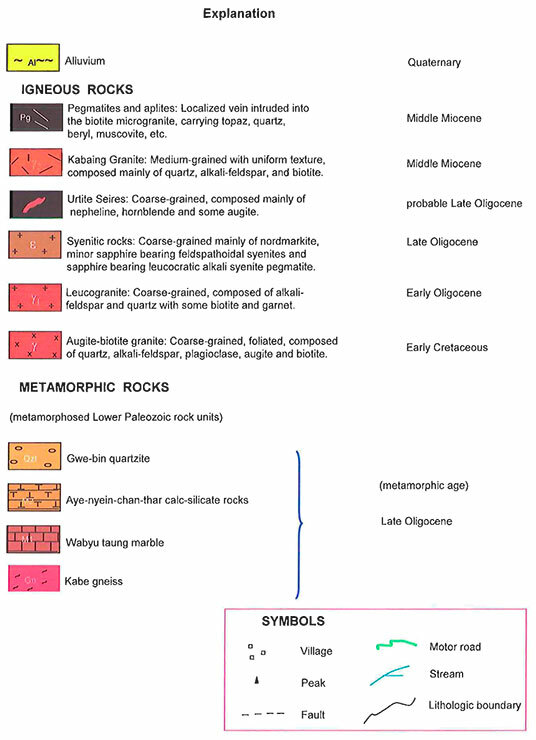 Petrology of igneous and metamorphic rocks. New York, McGraw-Hill. 2nd edt., 786 pp. United Nations, 1978. Geology and exploration geochemistry of the Shan scarps area, east of Kyaukse, Thazi and Tatkon, central Burma. Technical Report. UN/BUR 721002, no. 3, United Nations Development Programme, New York. Washington, H.S., 1917; Chemical analyses of igneous rocks published from 1884 to 1913, inclusive. U.S. Geol. Survey Prof. Paper, no. 99, pp. 9–1201. Wiebe, R.A., 1974. Differentiation in layered diorite intrusions, Ingonish, Nova Scotia. Jour. Geol., v. 82, pp. 731–750. Williams. H., F.J. Turner and C.M. Gilbert, 1982. Petrography; an introduction of the study of rocks in thin section. 2nd ed. W.H. Freeman and Co., San Francisco, 626 pp. Win Naing, 2001. 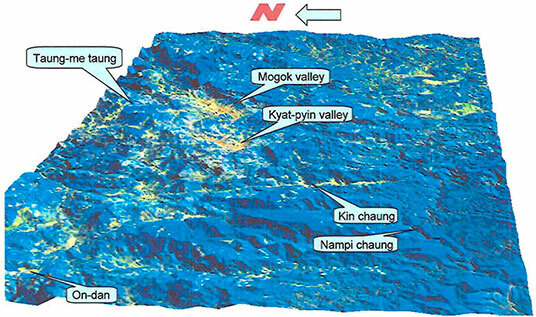 Tertiary deformation patterns of the northeastern part of Myanmar: structural and microfabric evidences from the Mogok-Momeik area. Unpublished M.Res. Thesis, Dept. of Geol., University of Yangon 198 pp. Wright, J.B., 1969. A simple alkalinity ratio and its application to questions of non-orogenic granite gneiss. Geol. Mag., v. 106, pp. 523–548.